Jumper - Boy London. Skirt - Primark. Heels - H&M. Bag - River Island. Watch - River Island. Absolutely love how youve styled this - I'd never have thought to 'dress up' a sweater like this. I'm deffs gonna try it with one of my logo sweatshirts :-) You look great!! Love this outfit!! Id never thought of a jumper with a skirt but it really does. love this look! the smarter skirt with the sweater is perfect! ps. 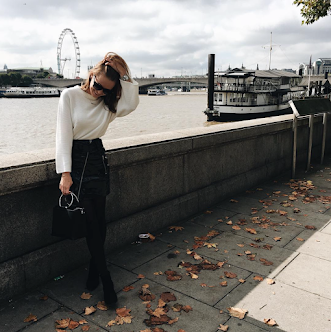 win RayBans worth up to £129 in my giveaway! click here if you like. I love this!! My kind of perfect outfit, comfortable and sassy haha.